The current campus of Bloomsburg University dates back to the purchase of three acres of land in June 1866. 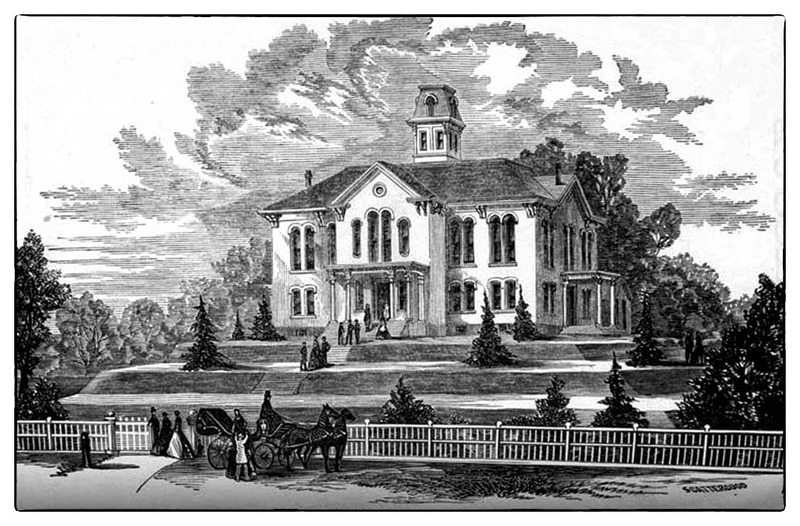 Within a month, construction began on what would be the first building of the Bloomsburg Literary Institute, Institute Hall, dedicated on April 3 and 4, 1867. That November, the building hosted the annual Columbia County Teachers Institute. The guest lecturer, James P. Wickersham, the Pennsylvania State Superintendent of Common Schools, was very impressed by the new facility and the work that Principal Henry Carver was doing. He suggested to the Institute’s trustees they apply to become a state normal school for teacher education. The normal school system for teacher training began in Pennsylvania in 1857, with Millersville becoming the first one to open. At that time, the state was divided into 12 districts, each of which would have its own local normal school, although in the following decade only four had been established. Columbia County was located in the Sixth District, along with Dauphin, Juniata, Mifflin, Montour, Northumberland, Perry, Snyder and Union counties. This was one of the six districts where the location of a normal school still had to be decided. Wickersham’s encouragement inspired the trustees and members of the community to turn their energies to securing Bloomsburg as the site of a normal school. Events moved quickly and by March 1868 meetings were held in the community. The trustees tried to determine the level of local support, especially financial, that could be secured for the establishment of a normal school in conjunction with the Institute. The primary expense would be construction of a boarding hall or dormitory, since it was a requirement that normal school students be housed on campus. In April, seven acres of land located just to the east and adjacent to the original plot were purchased for the new building. On the 18th, Carver’s plans for the dormitory, with space for an elementary school and other facilities, designed in consultation with Philadelphia architect Samuel Sloan, were approved. He was also awarded the contract to construct the building, provided the cost did not exceed $36,000. Two days later, the land was already being marked off and surveyed. Work soon began, and on June 25, 1868, an elaborate ceremony was held to lay the cornerstone. Hundreds were in attendance, including Superintendent Wickersham and the Governor of Pennsylvania, John Geary. Excitement was in the air, as there was every assurance that once the dormitory was complete, the Literary Institute would be recognized as a state normal school. The citizens of Bloomsburg and Columbia County fully supported these endeavors, and were urged on by the Bloomsburg Democrat. "All movement towards the promotion of the course of education should be fostered and encouraged. It is the duty of every good citizen to do this." Work on the dormitory went rapidly, with the stonework on the building’s foundation completed in July and all the brickwork for the four-story building up in late September. By the end of November, the slate roof was going on, as the building was being completed with almost unprecedented speed. Credit for this was given to Henry Carver, who was referred to as "an energetic, never-tiring man, [who] knows no such word as fail." In December, the Teachers Institute was once again held at the Literary Institute, and one of its features was a trip through the new building. Carver conducted the tour and gave the teachers an opportunity to see the apartments being provided for faculty members and their families. It was termed a magnificent structure, built in an L-shape with each wing 112 feet in length. The four stories contained boarding accommodations for more than 200 students, the faculty apartments, a large dining room and kitchen, and space for the planned campus training school. All work had proceeded to the extent that on February 8, 1869, the trustees wrote to the State Superintendent of Common Schools, stating that the Bloomsburg Literary Institute was ready to be inspected for its suitability as a state normal school. On February 19, Wickersham, along with a committee consisting of government officials and the school superintendents of Columbia, Montour, and Union counties, came to Bloomsburg for a thorough inspection. They attended the day’s opening exercises and then visited several classrooms to hear instruction and recitations. This was followed by a tour over the grounds and through the buildings, as well as a careful review of all official documents and the organization, faculty, and plan of study for the school. The committee then retired for deliberation and came back with a resolution that concluded, "Resolved, that the Bloomsburg Literary Institute is, in our opinion, entitled to recognition as a State Normal School, with all the privileges and immunities enjoyed by other institutions of like character in this Commonwealth." An official proclamation from the Pennsylvania Department of Common Schools, recognizing the Bloomsburg Literary Institute as a State Normal School, was issued on February 22, 1869. On this date Bloomsburg University officially became the Bloomsburg Literary Institute and State Normal School of the Sixth District and was duly authorized for teacher training. Although now a normal school, more work had to be done in the spring of 1869 to make the new dormitory building ready for students to occupy. One particular need of the dormitory rooms was bed clothing, which became a project for the ladies of Bloomsburg, who for the most part married to faculty members and trustees of the Normal School. They met on March 9 and decided to start their project by canvassing the town for muslin and money. In addition to the campaign there were fundraising efforts. In early April, an exhibition was held featuring exercises "calculated to instruct, entertain and amuse," with the admission charge of 25 cents going towards furnishing the parlor. In June, a strawberry festival was held, with the proceeds to pay for bedding and linen, and a further meeting in early August planned the procurement of bed clothing. Finally, on September 28, a vocal and instrumental concert provided yet more funds for adorning the building. 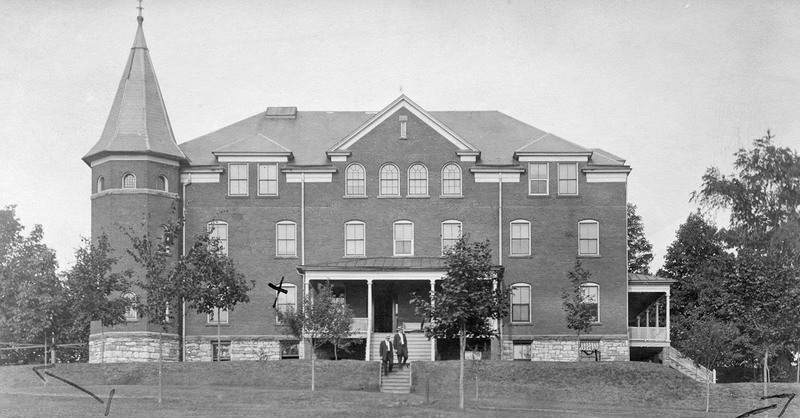 The dormitory served the Normal School well until a fateful Saturday, September 4, 1875, when the greatest disaster to befall Bloomsburg University occurred. About four o’clock that afternoon, the Normal School steward, Mr. Ford, found a fire had started in one room on the top floor. Though he put that out, the flames had spread inside the wall and up to the roof and in a short time were out of control. The sharp breeze blowing added to the destruction, while alarms sounded and hundreds of the townsfolk rushed to see what could be done to help. Thanks to the soundness of the dormitory’s construction, the fire spread slowly. The situation was also helped by the fact it started in the southeast corner of the L-shaped building’s south wing and the wind was from the northwest, meaning it would take some time for it to travel over 200 feet to the far end. This gave the citizens and students an opportunity to empty the building. In short order, everything of value, including books, furniture and clothing, was removed from the lower floors and even from many rooms on the fourth floor before the smoke became too intense. In the rush to get personal belongings out as quickly as possible, the upper windows were opened and trunks, suitcases, bedclothes and other items tossed out to plunge to earth. Proper facilities to fight the fire were inadequate, because even with a town reservoir full of water, there was no means to get it to the building in enough quantity to do any good. It took just two hours for the Normal School dormitory to completely burn, but thankfully with no loss of life and little loss of personal property. The loss of the dormitory was estimated at $60,000, half of which was covered by insurance. On Sunday, a call went out during church services for all citizens to meet at the Court House on Monday morning to see what assistance the town could render in the Normal School’s hour of need. The meeting was convened right at 8:00 a.m., resulting in the unanimous passing of a motion to immediately begin rebuilding the dormitory. A committee was formed to raise the necessary funds, since there was $30,000 in losses not covered by insurance. On September 21, State Superintendent Wickersham met with the trustees, who informed him of the work they were doing to see that the dormitory was rebuilt and the strong support of the citizens of Bloomsburg. Wickersham gave his assurances that he would also cooperate to see the work was accomplished. Six days later, it was reported all $30,000 in insurance money had been received, three weeks after the fire. The ground was to be prepared for the start of construction and just over one month later, on Saturday, October 30, the ceremony was held for relaying the cornerstone of the new dormitory. Plans called for the new building to be built in the shape of a T, using as much of the old foundation as possible. The main part of the building was 162 feet in length and faced west, with the stem of the T stretching 75 feet to the east. Construction work on the dormitory went right on through the winter, with the dedication held on April 26, 1876. The new building wasn’t fully completed, but ready enough for students and faculty to move in. Following the conclusion of the ceremony, many of the guests in attendance went to inspect the dormitory. It was built at a cost of nearly $48,000 and the visitors praised it for the beautiful walls, ceilings, and woodwork. The building would rapidly become the center of student life on campus. By the summer of 1889, the trustees were looking to once more expand campus facilities, with enrollment setting records each year and the 160 rooms of the existing dormitory filled to capacity. To meet the demand, the trustees decided to erect a large addition. The new wing was 43 feet wide and attached to the base of the original T, stretching 103 feet to Second Street to match the opposite end of the building. This would enable the dining room and kitchen on the first floor to be enlarged and the upper three floors reserved for student rooms. The cost of the addition came to just over $20,000. Work on the new wing went rapidly, with the interior of the two upper floors finished by the end of March 1890. The most memorable aspect of the new construction on the dormitory was a late addition. With both wings of the dormitory reaching to Second Street, it was decided to connect them with a porch, which stretched 170 feet along the entire south side of the building, parallel to the street. The construction of the porch began in May and was completed in less than two months. What soon became known as Long Porch was called "a great addition to the appearance of the buildings, and it affords a magnificent view of the Susquehanna Valley. The architect could not have designed a more desirable feature than this porch." That summer the existing rooms, though less than 15 years old, were remodeled with new wall paper and new furniture, including beds with comfortable spring mattresses. Pictures could now be hung from molding placed near the ceiling. 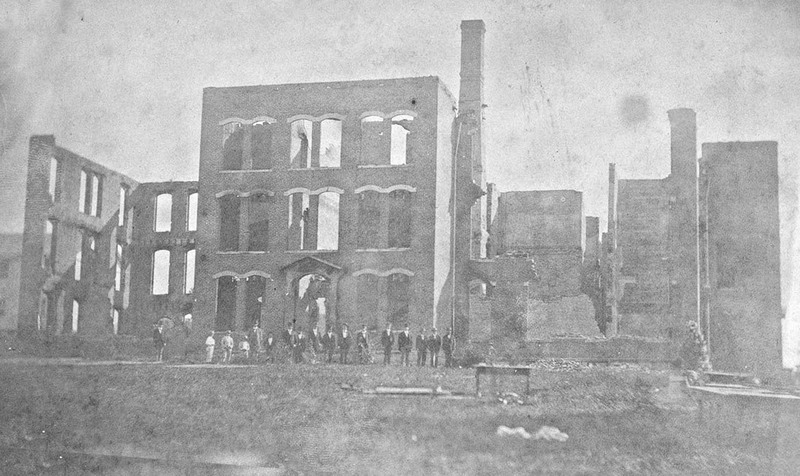 Fire safety was a priority, and so when the new wing was built on the dormitory, a tower seven feet in diameter was added to the northeast corner. It contained a spiral iron stairway reaching up four floors, intended for daily use but also serving as a fire escape. A further aid to students navigating the building’s floors was an elevator that could hold 30 passengers, installed in 1893. 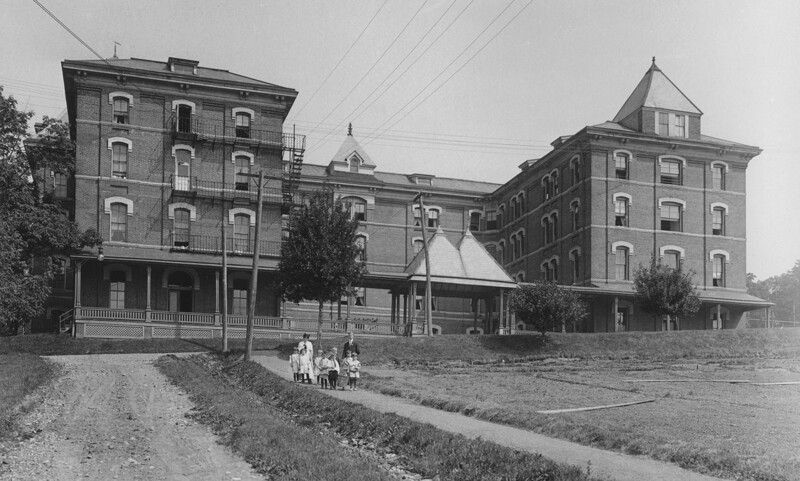 That same year, construction began on an annex to the dormitory that connected it with the model school building, located just east of Institute Hall. The four-story annex had offices and the library on the first floor, classrooms on the second, and dorm rooms on the third and fourth. Also part of the project was a gymnasium, built onto the north side of the annex. While the students had long had rooms on campus, the trustees now decided a building would be erected to serve as a dormitory for the use of male and female employees. It was to be multipurpose, with the campus laundry in the basement, living quarters on the first two floors and an infirmary on the top floor. The location chosen was on the east side of campus north of the main building, with ground broken on December 17, 1894. The dormitory was designed with one distinctive feature, a tower on the northwest corner, and completed in April 1895. Nearly a decade later, around noon on Thursday, February 4, 1904, a smoldering fire ignited in a first floor bedroom of the employee dormitory. Once again, students and firemen repeated what had been done nearly 30 years before, when furniture, clothing, and anything else that could be saved were systematically found and carried from the building. In this way, almost everything on the first two floors other than that found in the rooms closest to the fire was saved. The overall losses were estimated at $25,000 but, due to the efforts of the firefighters, the walls and much of the structure were saved, which led to more of a rebuilding project than complete reconstruction. 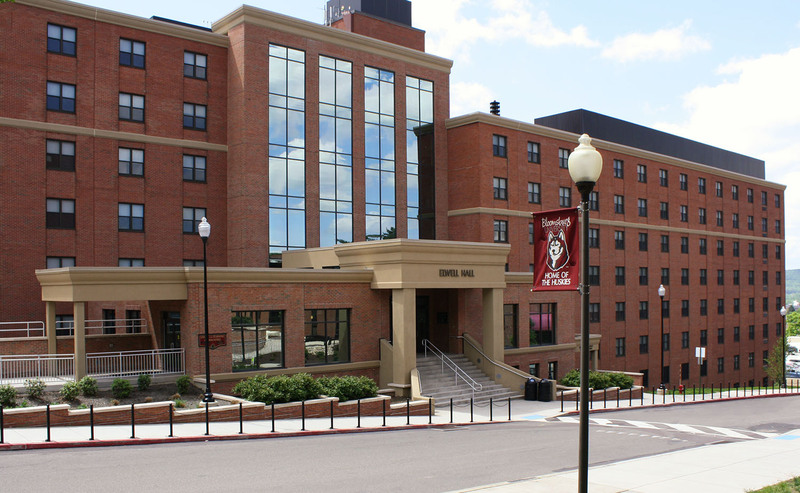 In less than two months, the building was repaired and remodeled, although now the only dorm rooms were those of female employees on the second floor. Otherwise, the basement, as before, held the laundry, with the Music Department on the first floor and chemistry laboratories on the third. The dormitory was completely remodeled in 1908, following the construction of Science Hall, when both the Music Department and labs moved out. The third floor was turned into dorm rooms for 16 male students and the following year the building was given the formal name of North Hall. When there was not enough room in the main dormitory for everyone in the 1910 spring term, the two main floors of the hall were given over to female students and employees were no longer housed there. In 1924, a final change came to the building when North Hall was remodeled to convert it solely into a residence for male students. At the same time, the rooms in the main dormitory formerly used by men were merged with the rest of the building and readied for women. 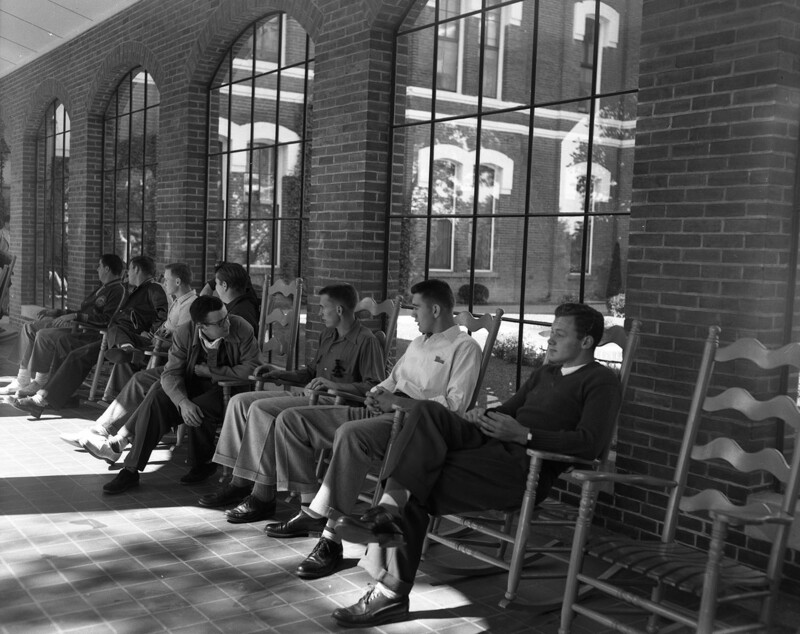 As the main dormitory neared the 50-year mark, one addition to it that marked the beginning of a long tradition occurred in 1921 with the placing of rockers and chairs on Long Porch. This provided a relaxing area for students to socialize. Within a few years, yet more time and energy was spent on modernizing the building. The work took place in 1927, a milestone year in the history of the university and the dormitory. That year, the Bloomsburg State Normal School became Bloomsburg State Teachers College; Francis Haas was named the new principal, soon to be called president; the dormitory was officially designated Waller Hall, in honor of graduate and former longtime principal David J. Waller, Jr.; and the first floor of the dormitory was remodeled and updated. The space was now being fully utilized with its transformation into a large, spacious lobby. Before this, social space in the building had been confined to small parlors designated for specific purposes. 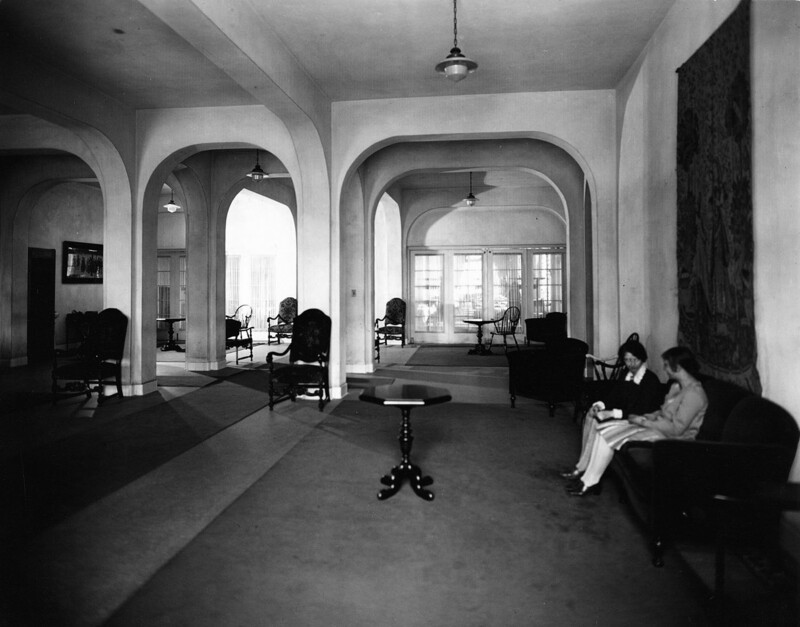 The lobby stretched from the main entrance on the west side to the dining room and was made possible by removing two stairwells on either side of the entrance and opening up adjacent offices. The lobby became the primary social space for students, alumni, and visitors to campus. Over the course of the next three years, both dormitories saw numerous repairs with the removal of all the wallpaper, the painting and replastering of walls, and replacing the wooden floors with a more fireproof material. It took nearly 20 years, but big changes also came to the campus gymnasium, completed in 1893. Permanent bleachers were added to the east and west sides in 1928 and 1932 as the walls were pushed back. This was only temporary, as plans were underway for a much larger gymnasium with a swimming pool. Money for this came from the federal government and work that begin in 1938 was not concluded until 1942 with the dedication of Centennial Gym. This freed the old gym for other uses, which meant during World War II its remodeling as part of the college’s adapting to the influx of military personnel from naval training programs. The gym became a social room for dancing and a canteen that provided light refreshments. In addition, dorm rooms and other space in both North and Waller Halls were again remodeled, in the case of Waller Hall to allow for the housing of the male naval trainees. Following the war, the old gym was turned into a formal student lounge and recreation center, with an elevated lounge on the east side put in place of the bleachers. When it opened in 1947, the newly remodeled Waller Hall student lounge and recreation center became the popular social spot on campus, taking over from the lounges. Students now had the opportunity to utilize the space for ping pong, cards, reading, or just socializing. The canteen was still in place to provide light refreshments and generate money for publishing the yearbook. All the class dances returned after the wartime restrictions and square dances, parties, and receptions in the Waller Lounge added a touch of warmth and friendliness. The most visible change to Waller Hall at mid-century was the replacement of Long Porch. The wooden structure of the nearly 60-year-old porch had deteriorated and so was removed in the fall of 1949. It was replaced with a $20,000 brick porch much more in keeping with the style of the rest of the building. A colonnade of 15 columns faced Second Street and seven more looked onto the courtyard. After six years, there were more renovations to the Waller Hall Lounge. In 1953, a stone fire place was added at the north end, in addition to more lounge space and a television set. The final work took place in 1956 when it was transformed into the Husky Lounge, which combined a Snack Bar and eating area with the College Book Store. The lounge now featured the student book store in place of the west bleachers to accompany the elevated lounge on the opposite side. Two years later 40 more dorm rooms were added to Waller Hall, which occurred when the old library space on the second floor was converted. This had been made possible when the library moved to the dining hall area on the first floor, which was freed up when the College Commons opened in 1957. While a great deal of time, effort, and expense had been devoted for the past decade to Waller Hall, little was done to the North Hall men’s dormitory, because it had been recognized the building needed to be replaced. By the mid-1950s, enrollment in the college had begun the steady rise that would last for several decades and more dormitory space for men was badly needed. This coincided with the development of the first campus master plan, drawn up by architect John Schell and formally approved in 1957. It was the first plan of its kind developed for any of the Pennsylvania state teachers colleges. The plan was intended for a college of 2,000 students, which enrollment projections said Bloomsburg would reach by 1965. It divided the campus from west to east into three areas of living, learning, and recreation. Anything built in those areas would have the appropriate function. Most of the construction work over the next decade followed this general plan. Even before the plan was approved, state funds had been provided for a men's dormitory. Work began on the building in the summer of 1958. The site selected for the dormitory was between the Grove and Navy Hall. In order to place it there, the 1894 barn and the 1915 infirmary, later the caretaker’s cottage, were torn down. Ground was broken for the dormitory in July. A name was needed for the building and Dr. Andruss came up with the suggestion to call it North Hall, to perpetuate the name of the first residence hall for men. North Hall, referred to as New North while the old building still stood, was completed in 1960, the same year the teachers college became Bloomsburg State College. 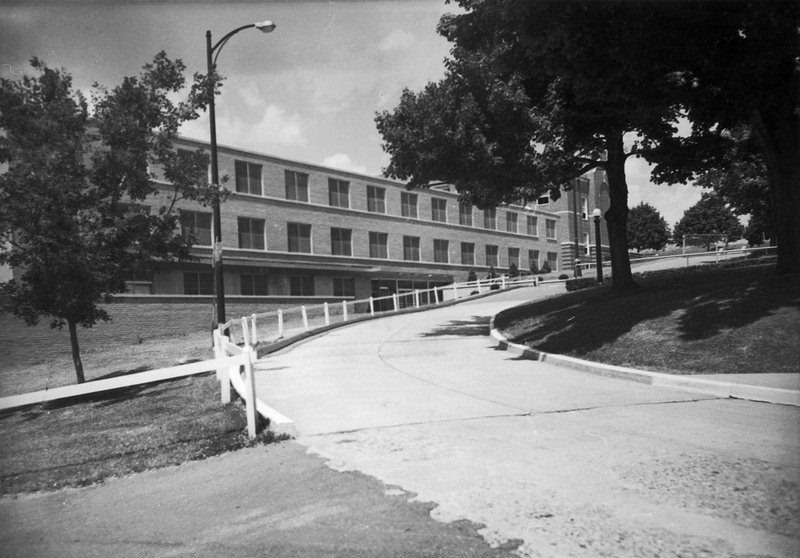 It would be the first of seven new dorms constructed on the lower campus between 1958 and 1976. Now that a new men’s dormitory had been completed, state funding allowed for more of the campus master plan to be realized with the construction of two women’s dormitories. The one to the west was located between Carver and Old Science Halls, right next to the 1919 War Memorial Pinery, honoring Bloomsburg students who had lost their lives in World War I. Unfortunately, its placement meant the loss of two of the memorial pine trees. Since the master plan called for the eventual demolition of Old Science, the dormitory was built right up to it with only a narrow walkway between. The more eastern dormitory was placed primarily in the old grove of trees that had been landscaped as a park, and right on top of a lagoon that had been enjoyed by students for more than 50 years. Construction began in 1963 on the dormitories that were to house a total of 500 students. Both buildings were ready to occupy in the fall of 1964 and were named East and West Halls. Dormitory construction continued to be a priority as the enrollment at the college continued to grow. In the summer of 1966, old North Hall, which had been used for faculty offices since new North opened, was demolished after 71 years to make way for another dormitory, to be named South Hall. Work began that year and was finished in 1967. The same year, groundbreaking took place on the lots of land across Second Street from Waller Hall, which had been purchased in 1889 and for years held gardens, grass, and flowers. In their place was to be the first high-rise structure on campus and one of the largest men’s dormitories in the state. The building opened in September 1968 and was dedicated as the Elwell Residence Hall on April 26, 1969. It contained rooms for 672 students, as well as offices for the Dean of Men and his staff. It was named for the Elwell Family, who included Judge William Elwell, a Bloomsburg trustee from 1867 to 1887; his son George Elwell, an 1867 graduate and trustee from 1887 to 1896; and grandson G. Edward Elwell, Jr., a 1905 alumnus and French instructor at the Normal School from 1914 to 1920, who was present at the dedication ceremony. On April 15, 1970, the four directional dormitories received new names. The trustees decided the residence halls should bear the names of the Pennsylvania counties that were home to the greatest number of students. North became Northumberland, South was now Luzerne, East became Montour, and West Hall, Schuylkill. 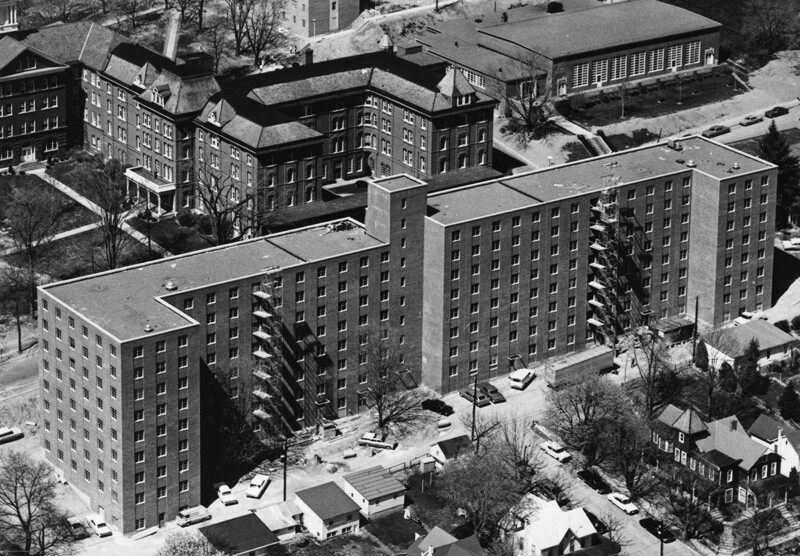 The final building completed in 1970 was the tallest dormitory on campus at nine stories in height, Columbia Hall. The last 400 women living in Waller Hall moved into the new residence hall for the 1971 spring semester. Now that the venerable old building was no longer being used as a dormitory, the master plan continued to be followed and Waller Hall demolished. This took place in January 1975, and so after 99 years Waller Hall was gone to make room for a new residence hall. Waller had replaced the first dormitory and was now being replaced by the final dormitory built on the lower campus in the state college era. Construction soon began on the building, which was dedicated in October 1976 as Lycoming Hall. Although the college continued to grow after 1976, gaining another 1,000 students through the 1980s, there was a moratorium on housing at the state colleges. This was put in place by the state legislature at the request of landlords in the communities that hosted the schools. Even so, as early as 1981, the college trustees had wanted to construct new dormitories, this time on upper campus land that had been acquired in 1962. The work did not start until after the moratorium was lifted, the college became Bloomsburg University in 1983, and funding became available through a bond issue. In early 1988, construction began on a $5.5 million project to build a 384-student residence complex, consisting of six buildings, each one with 16 two-bedroom efficiency apartments. It was located between Country Club Drive and the Nelson Field House, on the site of a former trailer park set up for residents displaced in 1972 by Tropical Storm Agnes. The Montgomery Apartment Complex, later called the Montgomery Place Apartments, was dedicated in October 1989. It provided housing for juniors, seniors, and graduate students. Within a few years planning began for additional student housing at the university. In 1996, the trustees endorsed the concept of building an additional housing project to accommodate 246 students. In order to satisfy the concerns of local residents living near the proposed site of the apartments, a larger buffer zone was created between it and nearby homes. Ground was broken in September 2000 and, in the fall of 2001, the Mount Olympus Apartments began to open before final completion early in 2002. The complex consisted of 41 six-person units, housing juniors and seniors, in ten air-conditioned townhouse buildings, built at a cost of $6.8 million. It was thought in 2006 there would be no further student apartments on campus when the state system put another moratorium on state-financed student housing projects. This changed just a year later as commonwealth bond financing was approved to fund a $31 million housing construction project. The new apartments were built on 15 acres of land donated by the Bloomsburg University Foundation. Construction began in 2008 on three four-story apartment buildings to house 544 students in 136, four single-bedroom units. Each unit had two bathrooms, a kitchen, and living room, with the complex featuring a community building. The new complex was ready in the fall of 2009, dedicated on October 16 and named in honor of former President Jessica S. Kozloff. Although new construction was limited to the upper campus, the lower campus student housing was not neglected, especially in terms of technology. Once the Internet gradually became more developed in the 1990s, the university worked to expand student access. In 1997, a four-year, $4.4 million project began to wire every building with computer access and each dormitory room with computer ports. Since 2005, wireless Internet access has been available in all residence halls and academic buildings. Over the past dozen years, smaller projects have been designed for the lower campus residence halls. Additions were placed on the front of Luzerne and Northumberland halls in 2005, while work was underway that summer and fall to create a pedestrian mall between them. Luzerne’s new entrance came to 2,812 square feet in size, while Northumberland’s was three stories in height and 3,080 square feet. When completed in 2006 for $1.5 million, the buildings now had more user-friendly lobby areas and increased study/meeting/classroom space, while students could walk in safety through the middle of campus. A similar lobby was added to Lycoming Hall in 2008. 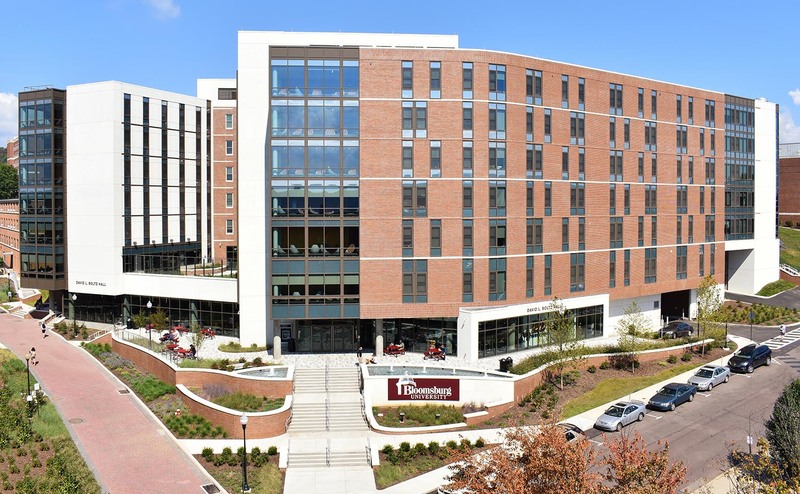 The largest dormitory renovation ever completed on campus was the $18.5 million renovation of 150,000-square-foot Elwell Hall, which began in 2011. All of the student rooms in the 700-bed facility received new furniture, flooring, shades, and doors, along with individually controlled heating and air-conditioning units. The project also renovated bathrooms and added student lounges, study/meeting areas, and a lobby and entrance that went up into the building instead of down. After two years, work was completed in the fall of 2013. The newest on-campus living option opened to residents on August 21, 2017. David L. Soltz Hall is a 7-story, 163,000 square foot structure featuring 135 suites and housing 394 students in 11 single, 37 double, 39 triple & 48 quad configurations. The building's first floor, which is open to the public, features the University Store, and two nationally known restaurants, Chick-fil-A® and QDOBA Mexican Eats®. The second story is home to a collaborative learning space and a rooftop terrace where residents can enjoy the outdoors. The plaza between Soltz Hall and Luzerne Hall includes a gathering space featuring a fire pit as well as the entrance to University Mail Services and the Husky Mail Hub. 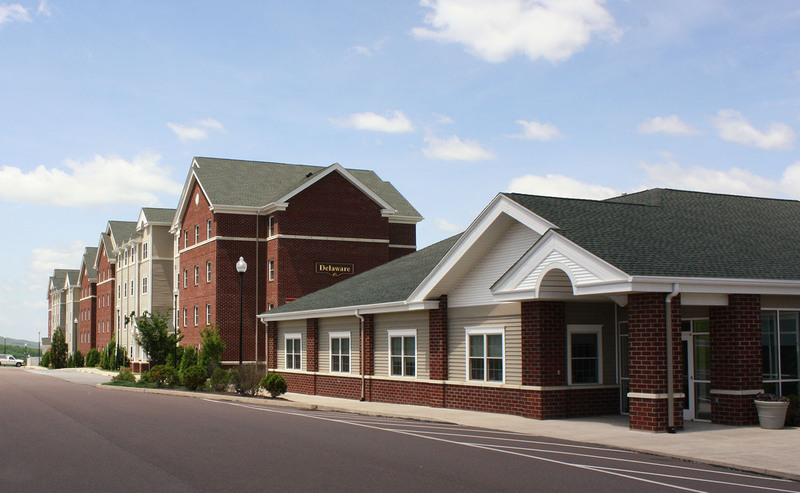 The mission of Residence Life at Bloomsburg University is to establish a learning based residential community which seeks to enrich human integration based on common, personal, and academic experiences; unified by purpose, and founded upon mutual respect. This experience is defined by an environment that encourages involvement, enhances decision making and conflict resolution abilities, promotes understanding and appreciates human differences, and fosters a sense of identity, self esteem, confidence and personal and civic responsibility. It is also a place where individual perspectives and opinions are valued, and students exert a high degree of influence over their environment. history visit the University archives.